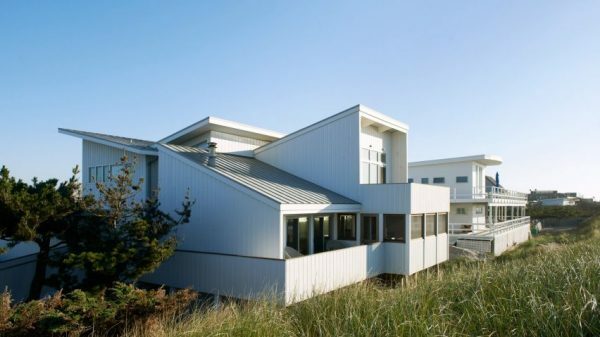 In keeping with a slew of recent articles in the A+D presses about houses, buildings, and developments in the New York Metropolitan area designed with a view towards offsetting possible damages in the event of another natural disaster on the scale of Hurricane Sandy, this Fire Island, NY house, designed by our friends at Delson OR Sherman Architects, was able to withstand the effects of Sandy, despite being located on an exposed beachfront, thanks to the invention of the designers, who completed their updates to house just before the storm struck. Barrier islands along the south of Long Island like Fire Island were among the worst hit by the storm, resulting in $70B work of damages. But this home was protected by features like vertical cement siding, metal roofs, and impact-resistant windows, giving it a strong exoskeleton.